Between you and me, I don't mind revealing that in the Heiman family our six-year-old daughter holds the prospect of making sand castles and eating fish and chips at the top of her list of favourite holiday pastimes. Luckily for her, our house is close enough to NSW's coast to meet the national coastal proximity average. So, as you'd expect, we've been beach camping a fair bit. In this article, I'll impart some of the lessons we've learned along the way, so that you can have the best time possible on your next adventure. When putting together your trip, there's nothing more important than location. The correct spot obviously depends where you live, but personally we've found our groove in Murramarang National Park. This park caters to a whole range of tastes and budgets within its 11,970 hectares. It spans 44 kilometres of coast and offers opportunities for budget camping or cabin accommodation; it also features a commercial resort, located just outside the park’s boundary. Our favourite site in the park is Pebbly Beach, which is midway between Batemans Bay and Kioloa and is accessed off an unsealed forestry road from the north or a sealed road from the south. The obvious appeal lies in the campsite’s close proximity to the beach, the spotted gums that extend almost to the high watermark, and the wildlife which can include species as varied as lyrebirds and monitor lizards within the campground. But for our family unit, the attraction of this coastline is personal. There are some pretty important memories wrapped up in this place — associated with weekend escapes, kite flying and paddling in rock pools — that will forever ensure this seaside location has a firm place in our hearts, regardless of the competition. When I was a grommet growing up in the coastal village of Woolgoogla, the local weekend cuisine was a box of Tiny Teddies washed down with a bottle of Coke. You’d surf hard all morning then pop back to the dunes to re-energise with a scoff. Around lunchtime, you’d pull-out and make your way to the local fish’n’chips shop for a dollar’s worth of chips. Dinner was whatever mum created. But if you were lucky, it was pizza from the shop around the corner. In between all of these, snack food was tropical fruit. Bananas were plentiful and every second person had some kind of citrus growing in their backyard. So, is food for beach camping much different? Well, I reckon that some of the choices that I made as a youngster were not optimal. But many of them had a kernel of common sense. And, with the benefit of an adult’s perspective, the key requirements are easy to identify: high energy and rich nutritioun! Surf Life Saving Australia are on the button when they remind us that heat exhaustion is relatively common with beach-goers, particularly the young and elderly. The fact is, when we’re knocking around in the surf or kicking up the sand, our body is losing water – in perspiration and respiration. Most good health guides will tell us to consume at least four litres of water a day. And, in the tropics, we may need to triple this. Physical activity and a lack of hydration can cause weakness, nausea, vomiting and light-headedness – all symptoms that could get us into deep water if ignored. So what are some good ways to keep up fluids on the beach? The first thing to remember is that alcohol isn’t the answer. Indeed, many beaches impose alcohol-free zones in an attempt to reinforce this fact. But this doesn’t mean that a day at the beach needs to be a day spent sipping nothing but H2O. Consider switching things up with other good choices. Coconut water is readily available and is known as nature’s Gatorade – full of potassium, sodium and other essential minerals. And there are now many fruit-flavoured options that have a high water content that are not as high in sucrose as the fizzy drinks that I reached for as a youngling. So, grab a SodaStream bottle and some of your favourite fruit mixers, and let the mocktails begin. We live in a time of opulence. When I was a kid, twelve volt fridges were rare as hens’ teeth. Now they’re a dime-a-dozen. But we may not have a fridge on hand when we’re down by the sand. If this is the case, our beach foods needs to hold their own when the sun gets high. Better still, they should also contribute to maintaining our hydration. After all, none of us are going to drink eight litres of bottled water a day – so we’re going to need our food to do some of the hard yards too. With these considerations in mind, watermelon is a no-brainer. Whip one of these out, slice it with a knife, and the kids will come running. Add a bowl of grapes, some apples, mandarins and some smart food like Nature’s wonder – the banana. With these sorts of options on hand, beach tucker is easy. No refrigeration needed and no cutlery required. With an icebox alongside, we can move from awesome snacks to wholesome mains with very little effort. A roast chook combined with salad ingredients like tomatoes, cucumbers and leafy greens take moments to prepare and provide the energy we need to keep on the go. If we don’t want to carry cutlery, it’s simple to slap the ingredients on some flat bread and wrap. And at night, lunchtime leftovers make awesome quesadillas around the campfire that will put a smile on everyone’s face. So far, the foods I've recommended are all great, healthy choices, but I can’t deny my roots. In my books, there’s nothing quite like a good fish’n’chips down at the beach from the local corner store. If we’re lucky, there’ll be a Fish Coop nearby where we know the fish is as fresh-as-can-be, where the ‘food miles’ are low, and where the profits go to the men and women who make a living bringing in the catch. So let’s look at how to make smart choices while we’re getting stuck into the ‘sometimes foods’. The best choice is to buy ‘good fish’ not ‘bad fish’. What we’re talking about here is choosing fish species wisely. For example, consider selecting fillets from species that are more sustainably harvested than others. And think about what species have higher reproductive rates than others and are quicker to grow. If we select our species correctly, we can enjoy the battered fillet on our chips safe in the knowledge that we’re not contributing to irreparable degradation of ocean fish stocks. If this all sounds too hard, it isn’t. Plenty of websites are now dedicated to informing consumers about the sustainable options that are available. So the next time you venture into your local ‘greasy spoon’ joint, you might like to make an informed choice. A fact’s a fact. Fish always tastes better if you’ve caught it yourself. When it comes to beach tucker, a fresh caught fish is probably as good as it gets. Other coastal favourites might include mud crabs, oysters, pippies and prawns. And options for harvesting the ocean’s bounty don’t cease at the higher water line. Consider, for example, common edible coastal plants like warrigal greens and pigweed. 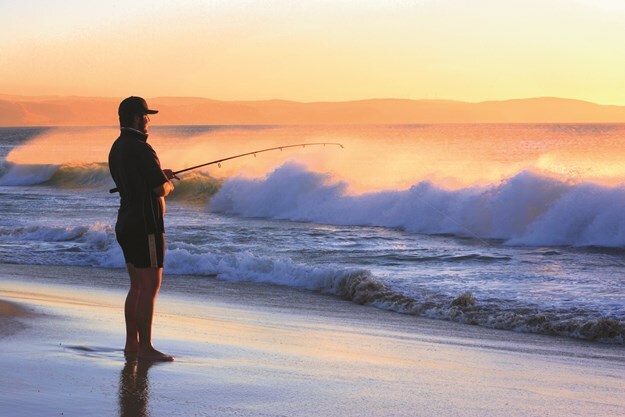 If you can channel your inner ‘Bush Tucker Man’, you can turn a day at the beach into a roaming feast. As in many walks of life, when it comes to bush tucker, you need to know what you’re doing. Oysters are filter feeders, so it’s important to pick clean water sources that aren’t polluted with agricultural or industrial waste. And with plant species, it’s vital to know what you’re looking for – and what you’re looking at. Once harvested, it’s also important to know how to treat food so that it is healthy, not harmful. Some may kill you raw and require blanching, roasting or some other cooking method to make safe, so get some local knowledge before you set out.